Get that classic 50s jukebox look updated with modern technology with the Pyle PTR8UR. 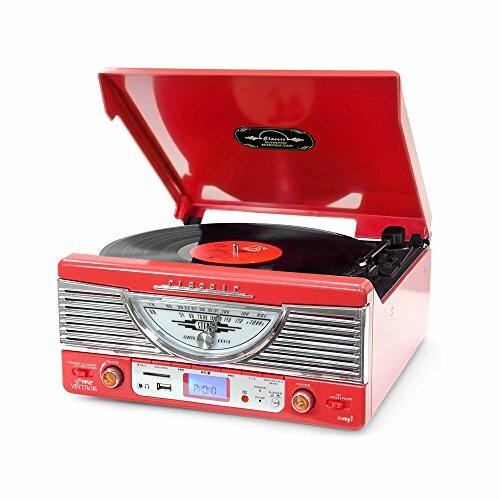 It’s equipped with 3-speed turntable compatibility, USB and SD card slots for MP3 playback, and an AM/FM radio to listen to your favorite stations. Plus, you can even convert your old vinyl records into digital MP3 files. It’s got dual 3-Inch built-in speakers, so you can listen to the classics without connecting to an amplifier -- or use the RCA line output to connect the PTR8UR into your home theater system. This retro turntable includes old-school details like a dial-scale radio with amber backlight, rotary volume control but also has new-school additions like a headphone jack and bass-boost technology! For the ultimate combination of old and new, there’s Pyle Vintage.